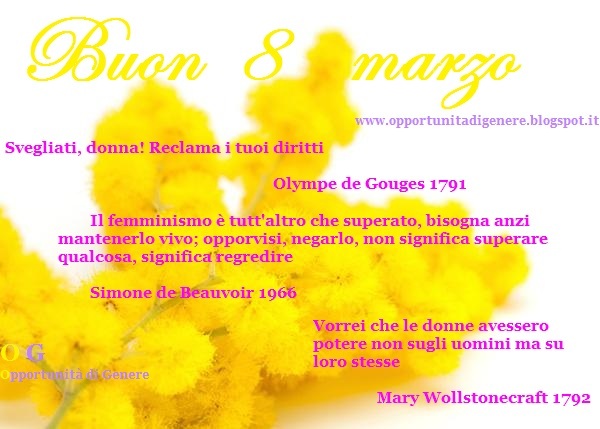 Today 8th March in Italy was held the event which affected the whole World and which involved Women internationally. After years this day has become a collective meeting around the World of all Women who have recalled the achievements got but most of all they want to demonstrate and make their voices heard on many needs that the status of Women want to reach. An event that worldwide saw each Country take part with its own specificities: The Global Women's Strike on the International Women's day. In Italy there are many events that every city has organized to call for unity and action their own female citizen, the more experienced, the less experienced, the young, the baby girls from Mantova to Bologna from Milan to Rome and Naples. This year it is chosen to celebrate this day in a collective way, after so many years since the claims of the '70s, Women will be in the streets to shout that things do not go well for Women in Economy against the gender gap moreover there are also categories like Sports in which female professionalism is not recognized at all. In home-care that is not recognized and therefore not paid but that makes go around the entire system of the Country, and the domestic violence: a Woman is killed every two days by her husband, partner, boyfriend or father. Futhermore in the health level Women have difficult procedures for a free abortion, there were also controversy on fertility and about the access to medical procreation. In Education Italian Women have no place in Literature, History, Art and even in the institutional as in everyday life speech but so also in Toponym of the public space as roads or squares and in the Mass Media. In particular, it was decided to march today in favor of all those Women who have suffered and suffer violence because one really do something in Italy for this which has now been called a social phenomenon, with the name of "femicide" and which is unfortunately accompanied by appalling figures of crimes that see Women brutally killed. Italian Women will ask a real Law to protect and give concrete help to many Women who every day suffer violence within their domestic walls without anybody knows it. The same omen had the President of the Italian Republic, Sergio Mattarella, in his institutional speech he discussed about Peace and pointed out that the presence of Women can make a difference to this condition that is necessary for humanity to progress and that only a law about violence against Women can give a tool to denounce and achieve freedom also for children involved in acts of violence . The Law under discussion in Parliament in fact is responsible for the first time to give assistance to abused Women and also to their children who are often witnesses and victims of violence themselves. The march is promoted by NONUNADIMENO ( not one less) a Women's network that began to denounce the social phenomenon of violence against Women, embracing theWomen's March and even the global strike of Women in both the public and private sectors with the slogan: 'if our lives don’t count then we strike'. And so in agreement with the major national Unions today has been declared the 24-hour national strike even of the public transport to allow Women and those who want to join the strike even if there has been episodes of deterrence by the smaller Unions that do not have joined the strike. 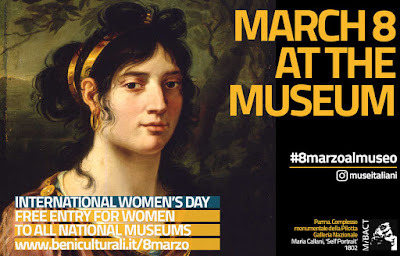 Many are then the cultural initiatives today all Women in fact will be admitted free of charge in all National Museums throughout Italy and many events are organized in honor of famous and important Women for the Italian History but not only: readings, exhibitions, book presentations , archaeological trails all in the name of Women. The controversy over the Mimosa, that is all an Italian matter, the flower that is the emblem of the Italian"Women's Day", because once it was natural in the streets and now instead has become a business for florists, and which was chosen by the Italian Parliamentary Teresa Mattei in 1946, remained on the corner compared to the global scope of the event that has seen after thirty years Women to return to the streets all united against violence against women, for new social, political and cultural Rights. Everyone for the occasion dressed in fuchsia and black instead of red as their American or English collegues.